From the street to the building is a long driveway. The building is two storeys tall with vinyl siding to look like wood. An enameled green steel roof brings a modern lodge appearance to the building. 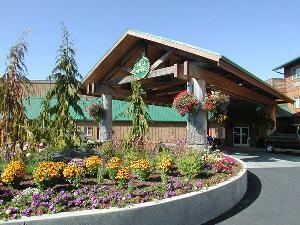 The road ends at a circular driveway going around a decorative stone and floral centerpiece with a sign in the middle of it that reads, "Log River Casino". At the peak of the circle, it goes underneath an overhang to protect people from the elements as they go inside. There is a large parking lot to the side of the building, as well as a separate set of doors for easy access from there. Dating back to the mid-1970s the interior of the casino has not exactly seen much updating. Several newer machines have been wedged in with the old classics. Going through the front doors leads to the main lobby with a small fountain the middle as well as a sign showing the dates for the entertainment that's coming to the stage. There are two barely separated sections of the casino and the gambling side creeps into the bar side. Every three feet or so along the bar is a mini-slot machine. While at one point the 70s look might have just been outdated, in recent years the lack of updating is used to create a playful and authentic themed 70s feel. The bartenders serve special roiling bubbly drinks in lava lamp glasses with changing led lights. Glasses are shaped like mirror balls. Brass poles several feet from the bar have small, pill-shaped standing tables. Dark orange wallpaper — with large, round light sconces dotting the walls — surround the entire bar. 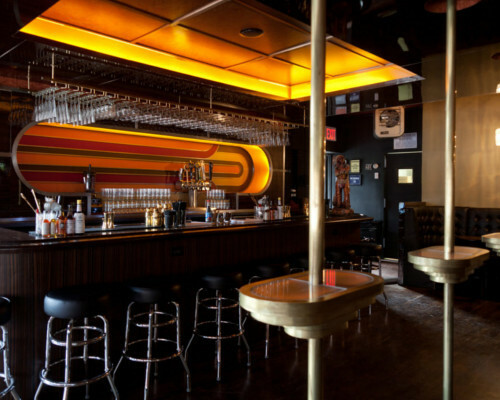 Behind the bar is a large, pill-shaped recess in the wall displaying crimson and goldenrod disco-era designs in backlit plastic. Plush, leather stools provide seating at the dark wood bar, and there are several tables and booths of the same wood and leather dotted around the area. The actual casino is a bit of a well-planned, if cramped, maze of slots, poker, and other gaming machines. In the center of the maze is the green felt card tables, high rimmed craps tables, and well-polished roulette tables. To the right of the front doors appears to be the actual casino itself with older slot machines lined up against the walls, and in the center of the large room are the card tables with the dealers ready to play their games. Dotted on the ceiling, among the lights are the cameras which keep an eye on everything at all times. It is no rumor that the security team here do not mess around. It might be a small town on the Oregon coast, and the casino might not be in the greatest shape. But the security team operates like they are on the Vegas Strip. Craps is an exciting, fast-paced game. One of the beauties of this famous casino game is that you don't have to know everything to play and have fun. Start by learning a few basic bets and work your way up. This pamphlet is designed to get you started. If you have any questions, the Table Games Staff is here to help. 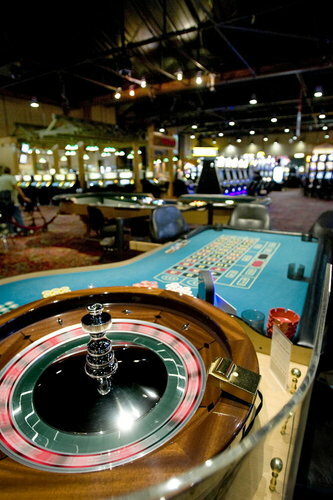 Blackjack – daily starting at 11 a.m.
Roulette originated in France over 300 years ago. It is a fun and easy game to play and offers a wide variety of payoff odds. An exciting stud poker game offering four ways to win. Bets may be made against the Dealer or on the value of the hand or both. While her father saw to the original construction of the Casino, it was Elizabeth's business acumen that has seen it become the destination it is today. George left management and passed the deed to his daughter Elizabeth over a decade ago so he can enjoy a retirement of world travel.